Lost in the Movies (formerly The Dancing Image): TWIN PEAKS First Time Viewer Companion: S2E8 "Drive With a Dead Girl"
TWIN PEAKS First Time Viewer Companion: S2E8 "Drive With a Dead Girl"
The previous episode may have felt like a natural end to the story, despite leaving so much unresolved. Yet what makes Twin Peaks so fascinating, something I want to keep coming back to investigate, is that it doesn't end where it should. 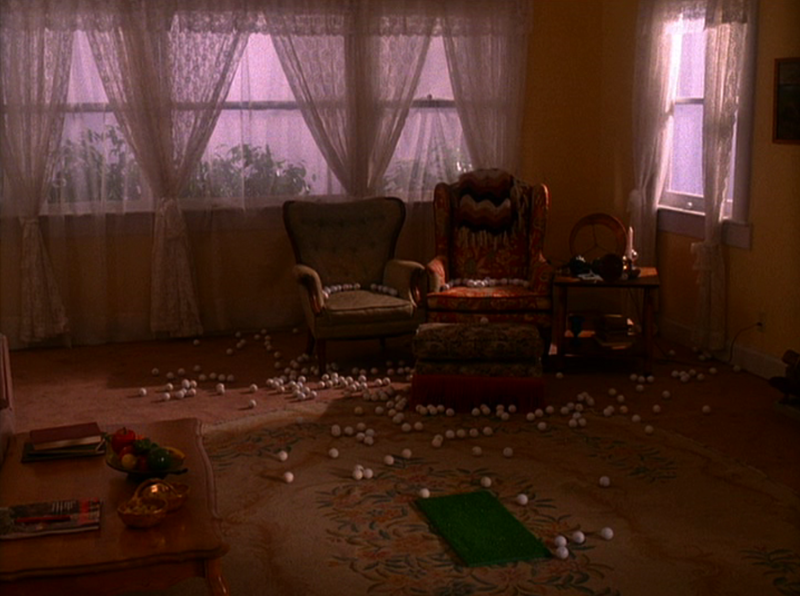 Keeping the story going at once compromises Twin Peaks' integrity but also enriches and expands. Here is where the tensions at its heart really emerge: the pragmatism of Mark Frost vs. the stubborn vision of David Lynch; the idea of Twin Peaks as a universe w/ multiple strands ("the town") vs. a single, albeit complex story ("the Laura mystery"); but perhaps most of all, entertainments vs. art. That's a tricky and overly simplistic dichotomy - the two categories frequently overlap, here and elsewhere. But it really does get at the weirdness of the show, that we could end on such a profound note last week before returning to a more smoothed-over, casual, laid-back style this time. And it isn't just that the show holds both of these extremes - it's that it has to shuffle between them. That's why this episode is one of the most unusual of the entire series so far (most obviously by making Leland, not Cooper, the character with whom we share the most vital information). On the one hand, we are being pointed in the direction of the show's back half which, as we've already witnessed in the weaker moments of early season 2, conceives of Twin Peaks as a week-to-week check-in on a wacky town and its lovable denizens. I've given this tendency crap in the past and I definitely still think it's a misunderstanding of what gave the show its initial strength. Still, watching the episodes twice weekly has done wonders for my enjoyment of Twin Peaks' minor charms - never has it felt more naturally like "a TV show" to me, and I've enjoyed spending time with the familiar characters and the locales even when the subplots that enable these affectionate visits are flimsy. On the other hand we ARE coming right out of the show's ground zero, a purely Lynchian exercise in dread and the uncanny. As such, the episode can't help but have some residue of that experience, even if it dials it down dramatically. So we have this odd compromise between the most mundane Twin Peaks and the most brilliant. While the show's attempts to "normalize" Leland's mania, Maddy's murder, and the extra layer of Mike/Bob weirdness floating around the atmosphere are sort of disappointing, a part of me can't help but find this water-down process illuminating in its own regard. At the risk of oversimplifying, art shows us how a unique individual sees the world and plays with the capabilities of the medium to express a personal vision, whereas entertainment tends to borderline-unconsciously reflect and channel the accepted norms of a given moment in society/pop culture. The richness of Twin Peaks is that it can offer both routes for exploration. Next: "Arbitrary Law" • Previous: "Lonely Souls"